High Wire Distilling has been crafting bourbon from Jimmy Red since 2014. This year's release of over 1,900 bottles comes from 14 acres grown in 2015, and is sold in a special Le Creuset bottle created for High Wire Distilling. "In the 1980s, you used to be able to go to James Island," recalls Glenn Roberts, founder of heirloom seed purveyor Anson Mills. "And, if you knew the right people, they'd sell you delicious food out their backdoor kitchen and you'd get a jar of Jimmy Red hooch with it. But though I knew the hooch, I never knew the corn." Nobody really knew the corn – not until the early 2000s, when the last known bootlegger growing the corn died, and the corn almost died with him. Two ears were rescued from his plot and gifted to celebrated local farmer and seed saver Ted Chewning, with the suggestion that he grow it out for his hogs. Chewning loves to save seeds — he has revived nearly extinct corns, beans, heirloom radishes, watermelons and field peas. He rescued Jimmy Red as well, growing it and saving kernels each year, increasing the seed stock. Little did he know that soon it would burst on the restaurant scene as a prized heirloom cultivar that makes unforgettable red-flecked grits and a rich, smooth whiskey with honey-nut undertones. "This is what grits must have tasted like a hundred years ago," says Forrest Parker, chef de cuisine at The Drawing Room, at the Vendue Hotel in Charleston's historic French Quarter. "It behaves like no other corn I've distilled," says Scott Blackwell, co-founder of High Wire Distilling in Charleston, S.C. "The pearls of oil on the distillate taste of marzipan and light cherry — not corn." Soon the siren corn was calling to others. Chewning gave seeds to organic growers and farmers and even to food historian David Shields, author of The Culinarians: Lives and Careers from the First Age of Fine Dining, who boarded it onto the Slow Food Ark of Taste, a catalogue of endangered heritage foods. He gave it to chef Sean Brock, who grew it himself and started serving Jimmy Red grits, cornbread and flapjacks at his storied Charleston restaurants, McCradys and Husk. Brock loved the flavorful corn so much he had it tattooed on his arm. With Brock's patronage, Jimmy Red was suddenly a celebrity cultivar across the country. Venues like Charleston's Fig, whose executive chef, Jason Stanhope, is a James Beard award winner, put grits on their menu for the first time. Jimmy Red grits have been grown and served by Chef Ryan Pera at Coltivare in Houston. They have also been on the menu at Gavin Kaysen's Spoon and Stable in Minneapolis. They are grown, milled and even sold online by Greg Johnsman of Geechie Boy Mill, of Edisto Island. "When you open the bag to decant them, this wonderful nutty aroma wafts out," says Chef Parker. "The grits pair really well with brown butter sauces at dinner." 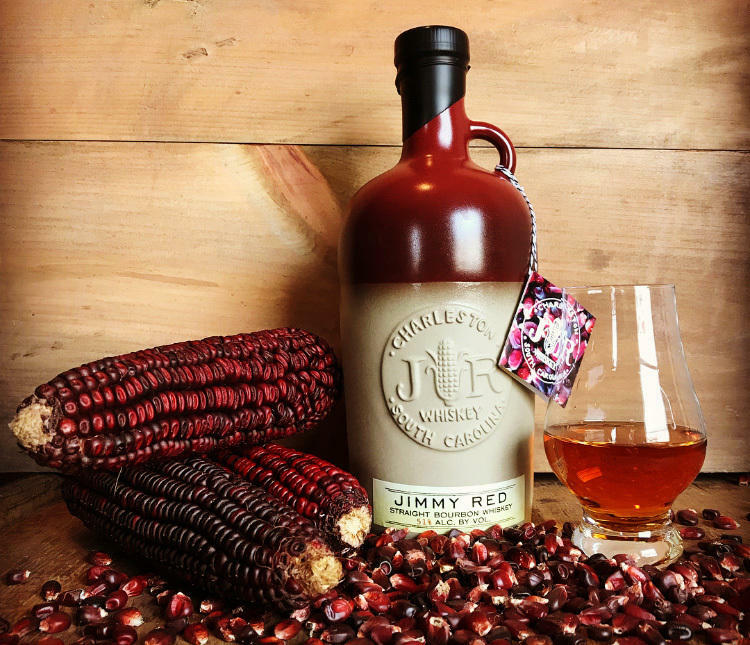 If corn had a personality, Jimmy Red might be described as demanding but inordinately generous. Like many heritage corns, it is an open pollinator — the plant version of promiscuous, easily fertilized by pollens blown its way from other corns. To ensure purity, the corn requires hand pollinating, says Glenn Roberts of Anson Mills, who now sells Jimmy Red grits to chefs and also grows the corn in three different geographic regions to ensure that no natural disaster wipes it out. Wax-coated bags are placed over the plant's tassels (the male flowers) and silks (part of the female flowers). The pollen accumulates in the bags, and is later collected and dusted by hand onto the silks. Like all field corns, it must be harvested when mature and is inedible unless processed. (In contrast, sweet corn is picked at the milk stage and can be eaten raw or cooked.) But the most pronounced feature of the corn is its unusually large germ — the soft center of the kernel, where the flavor resides. It's so large that when ground, the grits take most of the intensely flavorful flecks of the germ with them. And when distilled, that germ gives off the fragrant oil Blackwell marvels over. It also carries within its brilliant red ears an invisible history of cross pollinating and cross-breeding. "If you grow it out in large enough plots," explains Roberts, "it will begin to throw off new varieties. I've seen five new distinct varieties, and kept two." Roberts has seen ears with an orange or white endosperm, kernels that are blue or white. He believes the corn was crossbred with decorative Native American thanksgiving corns at some point. The flavorful germ offers endlessly creative outtakes on cooking. "If you want your grits pink," says Roberts, "cook it with an acid like Ogeechee lime juice. If you want purple or even black grits, put some baking soda in to render it alkaline." If grits are one part of the story, whiskey is the other — and perhaps the ultimate fate for an old hooch corn. 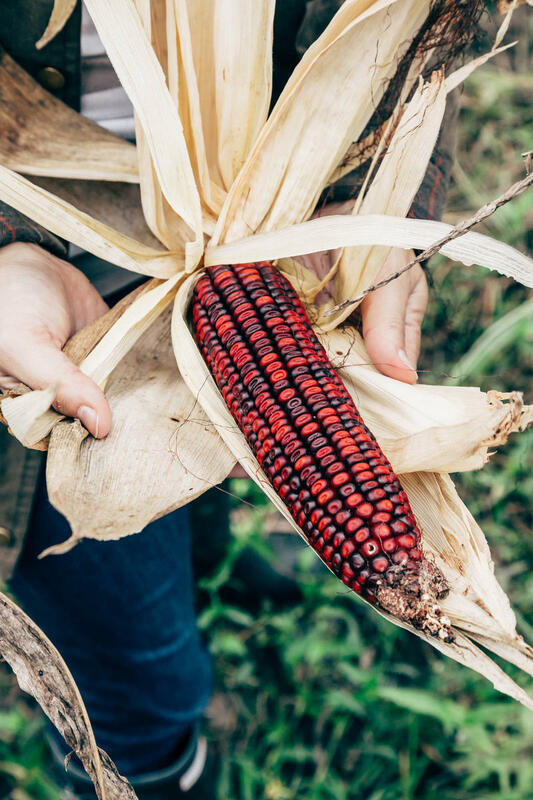 "I've been thinking about this corn for years," says Scott Blackwell — ever since 2014, when Roberts laid 50 different heirloom corns out on a table for him to view. "Which one makes the best whiskey?" he asked. Roberts didn't miss a beat: "Jimmy Red." "I'll write a grant check to Clemson University to grow that one," Blackwell said. Clemson University research scientist Brian Ward, who specializes in bringing old seed lines back from near extinction, grew 2.5 acres that year. Roberts took the harvest up to his seed house, cleaned and milled it, and sent it back to High Wire Distilling. "Right away I could tell it was very different," Blackwell says. "Super earthy. Super sweet. Like banana laffy taffy." He crafted two barrels of 100 percent corn-based bourbon (aged in virgin charred barrels). The whiskey didn't need wheat or rye for flavor. Jimmy Red had enough flavor on its own. From those two barrels, the distillery crafted 570 bottles of bourbon that, according to Ann Marshall, Blackwell's wife and business partner, sold out in 11 minutes. "Luckily we had ¾ of a tasting bottle left that we took home for ourselves." In 2015, Blackwell grew 14 acres of Jimmy Red. In 2016, he grew 65 acres, and in 2017, he grew a generous 85 acres. The bourbon from the 2015 crop is being released now, as it's aged for two years. Blackwell has experimented with different farms, and is labeling bottles by the farms they were grown on. "The soil of the farm totally changes the taste," says Blackwell — as proven when he shared fresh, unaged bourbon with this author on a Saturday in late October. The whiskey from a farm called Lavington (with peaty black soil) had sweet floral notes, while the same whiskey from the Pee Dee River valley (with sandy loamy soil) tasted like earthy green banana and butterscotch. After being aged, those distinctive flavors will merge into the smoky tannins of bourbon. "This is really a community story," says Roberts. "This entire community of Southerners saved this corn." He pauses and reflects back. "My daughter's first corn doll — made 18 years ago when she was 8 — was crafted from Jimmy Red. She used the shucked ear to make the doll, the husk and silk for the clothing and hair, and one red kernel for the heart." 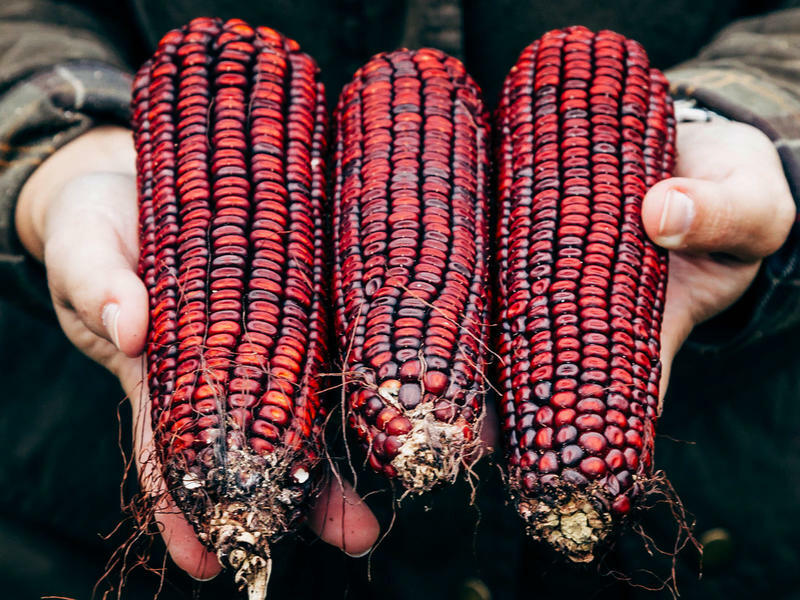 Indeed, heirloom cultivars like Jimmy Red are the heart of a Southern renaissance in traditional foodways, the repatriation of seeds as well as recipes — weaving together flavor and history into meals and drinks to relish and remember. Jill Neimark is an Atlanta-based writer whose work has been featured in Discover, Scientific American, Science, Nautilus, Aeon, Psychology Today and The New York Times. Copyright 2018 NPR. To see more, visit http://www.npr.org/.